There's a growing movement in the RCRC community to use RC methods not only to create value but also to create equity and leverage diversity. RC and equity. Last week's RC cafe focused on Relational Coordination in Organizational Networks: Managing for Coordination and Equity facilitated by Gabriela Corbera (Global Social Innovation). Dana Minbaeva (Copenhagen Business School), Vasilica Margalina (Universidad Tecnica de Ambato) and John Paul Stephens (Case Western Reserve) showed how RC can be strengthened to create value in product supply chains and construction supply networks, and they described interventions for doing this. But how to ensure the most powerful players do not capture all the value created by RC? The Fissured Workplace by David Weil (Heller School, Brandeis) helps us to understand the power dynamics in distributed supply networks. And RC provides a methodology to make visible how weak and strong players coordinate to create value, thus helping to build relationships of shared goals, shared knowledge and mutual respect to foster a more equitable distribution of value (see Transforming Relationships by yours truly). How to get more powerful players to the table? Christine Bishop (Heller School, Brandeis) described the partnership built between nursing homes and their workers in New York State that succeeded in increasing reimbursements from the state legislature in order to increase pay for workers and quality of care for residents. Erik Nicholson (United Farm Workers) described a UFW demonstration at the Starbucks annual shareholders meeting last week to pressure Starbucks to stop sourcing milk from dairy farmers who exploit dairy workers, and showed how workers and small producers are organizing together to gain greater parity with the big brands. Maybe what's needed is a combination of soft power (building relational coordination with the dominant player) and hard power (building relational coordination against the dominant player) - and an ability to move back and forth easily between the two to redistribute value. Listen to the RC Cafe here if you missed it! RC and diversity. New findings on Workforce Diversity and Firm Performance: Relational Coordination as a Mediator and Structural Empowerment and Multisource Feedback as Moderators will be published by Hun Whee Lee (Michigan State University) and Eunhee Kim (Cornell University) in a forthcoming issue of Human Resource Management. They found that certain organizational practices can leverage diversity as a positive force for RC, leading to increased operational and financial performance. Read on for more partner updates. 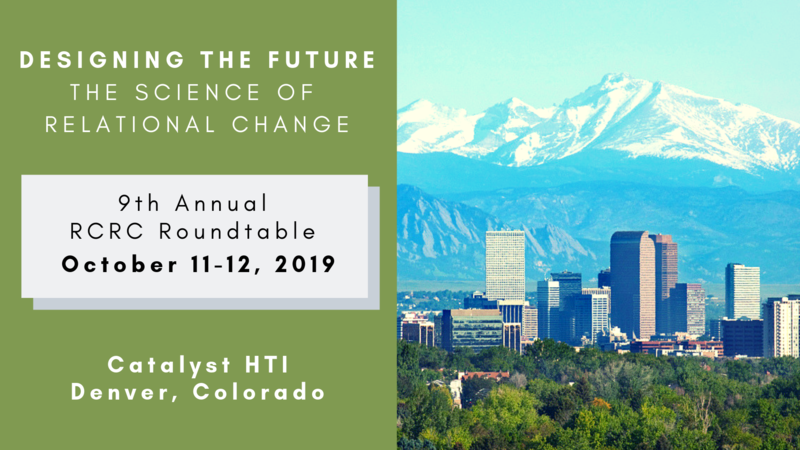 Also check out the Call for Abstracts for our Annual Roundtable in October - Designing the Future Using the Science of Relational Change. The RCRC team and our Denver host committee are hoping to see you there! We are thrilled to welcome many individual partners who've joined this month from the Veterans Health Administration, a new RCRC organizational partner. We also welcome new student partners Raveendra Wagh (TISS, India), Nathan Woods (Antioch University, Ethiopia), Emily MacIntyre (Simmons University, USA), and Deborah Strod (Brandeis University, USA). Please give a big welcome to Dr. Callie Watkins Liu, an RCRC faculty partner who has become a Visiting Research Scholar at the Heller School at Brandeis, sponsored by the RCRC and the Office of the Dean. Dr. Watkins Liu is an intersectional and critical race scholar-activist, whose research focuses on social structures, social movements, race, ethnicity, policy, pedagogy, research and knowledge production. Some of you have met Callie at previous Roundtables in NYC and Boston, and we're hoping she will join us again in October! Team Working Life just received a long sought after grant from the Danish Work Environment Research Fund to develop and study an RC intervention to improve work processes and worker outcomes in construction projects. Congrats to Inger-Marie Weigman, Karen Albertsen and their colleagues! Last week an international group of RCRC partners gathered at a workshop at BI Norwegian Business School called "Boundary Conditions for High-Quality Work Relationships in Inter-Organizational Contexts" including Ragnhild Kvaushagen, John Paul Stephens and Daniel Massie. Also last week Jenny Rudolph (Center for Medical Simulation), Victoria Brazil (Bond University) and Eve Purdy (Queen's University/University of North Texas), presented "Learning to Be Better, Together" at SMACC Sydney - a huge conference on simulation drawing 3,000 people - sharing about their RC interventions at the Gold Coast Health System! Change is happening all the time. But we are often overwhelmed by its unintended consequences. Can we get better at creating positive change intentionally, as individuals, organizations, communities, institutions, and countries, through mindful attention to the consequences of our actions? How can we embrace unintended consequences that add value, and better anticipate those that destroy value? To do so may require more inclusive approaches - systems thinking, design thinking, collective action, etc. - supported by relational coordination. At this year’s RCRC Roundtable, we will explore how to use intentional change to solve the most pressing challenges we face by building relationships of shared goals, shared knowledge and mutual respect with all relevant stakeholders, both visible and invisible. Join us October 11 and 12 in Denver, Colorado where innovation and change are the new normal. Our local host committee will welcome us and show us the best of Colorado, both old and new! We are requesting abstracts relating to research, practice or education, based on work that is either completed or in progress. We welcome submissions from multiple disciplines and methodologies. Research abstracts can include projects that are either completed or in progress. Practice abstracts may include an intervention that is either completed or in progress. Teaching abstracts can include methods for teaching about relational coordination at an undergraduate or graduate level, including for example MBA, MD, RN or other professional programs, or as a theory or research method in a PhD program. Presentations will be given in a presentation format with opportunities for interaction and discussion. RCRC Student Partners who have abstracts accepted will be eligible for complimentary Roundtable registration as well as a small amount of funding for travel support. NOTIFICATION OF ACCEPTANCE, AND REGISTRATION FOR ROUNDTABLE: You will be notified by June 30 at latest whether your project has been selected for presentation. Early registration ends July 15. QUESTIONS: Feel free to contact Tanya Allain at tallain@brandeis.edu or any members of our selection committee with questions. Organizational change is often top-down, with negative consequences for engagement and sustainability. While much of our knowledge about change tacitly assumes a top-down approach, such an approach is unlikely to succeed, particularly when changes in work relationships are required. A relational coordination approach to change typically begins with an initial assessment to understand the organizational context as well as the range of interests and perspectives present in this context. This assessment is followed by a scoping process in which stakeholders are collectively engaged to identify a work process in need of coordination. Participants use a range of tools including relational mapping to identify the core set of roles that must coordinate to produce the desired performance outcomes. Subsequent stages involve communication planning, deployment of the RC Survey, followed by presentation and sense-making of findings with key stakeholders to generate dialogue about the strengths and opportunities that exist in a particular context, inclusive of senior leaders and front-line staff. Participants then design and implement interventions, assessing progress with periodic assessments of relational coordination and desired outcomes. This change process is often led by a change team representing key stakeholders. But how to create and lead a successful change team? This cafe will bring together change leaders from education and healthcare sectors to share their setbacks and successes.